It’s that time again! Time for your family’s friendly elf to arrive! Some choose to let him or her arrive on Thanksgiving night, while others wait until the first week of December. Generally, the elf comes during the night after you put your Christmas tree (which would be crazy at our house since that’s usually mid-November!) No matter when he or she arrives having an Elf on the Shelf Letter is a great way to welcome your holiday friend! Pair our letters with the Elf on the Shelf book before bedtime and you’re ready for another December of elf antics! It’s always important to read the book because it helps the kids remember the magic so they don’t try to touch or move your elf during the holiday season. One of the most fun ways you can say hello to your elf friend at the start of each holiday season is with a welcome letter. This comes along with Snowflake, Kringle or whatever name you have chosen for your friend. If you need help choosing a name this year, we can help with tons of Elf on the Shelf names and a generator! The letter basically says hey from the elf and Santa Claus, and may also come with a small gift for your children – think holiday books, a Christmas DVD or some sweet treats for them to enjoy! When should you use an Elf on the Shelf arrival letter? If this is your family’s first year with a visiting elf, you may want to include a small note that introduces the new friend to your kids. This can be as quick and fun or more drawn-out as you want it. Fun things to include in an Elf on the Shelf introduction letter would be the name of your elf (assuming your child didn’t name it), his interests, a mention of his best friend at the North Pole, and a quick reminder that he will be reporting your children’s behavior to Santa. What should you include in your Elf on the Shelf welcome letter? If your kids have already met your elf, you can do more of a welcome letter with him rather than a full intro. Similar to the introduction letter that your elf may bring on the first visit, the welcome letter offers a big hello to your children after a year of not seeing their friend. The elf may remind them of his name, the importance of not touching him, and to be good to stay on Santa’s nice list. If you are stumped on what to write in your Elf on the Shelf letter, or simply pressed for time, download the printable arrival letter at this end of this post! Have your elf suggest the kids write a letter to Santa asking for their 3-4 most wished for items. Include a small ornament kit so your kids can have fun creating a new piece for the Christmas tree. 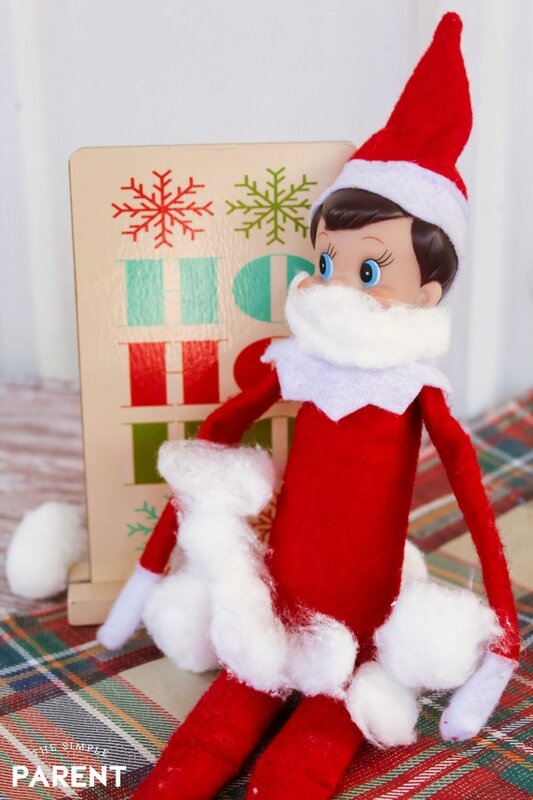 Add a fun treat to the letter to get your kids more excited about the Elf on the Shelf’s arrival! Think hot cocoa, movie, or candy! Don’t Forget the Elf on the Shelf Goodbye Letter! It’s also a neat idea to have your elf bid farewell on paper when Christmas Eve arrives. Traditionally, your elf will fly back to the North Pole or hitch a ride when Santa Claus comes to drop off presents and grab the cookies and milk you leave out. If your children tend to be emotional with goodbyes, an elf on the shelf return letter can be a great way to help them cope with missing their little buddy once Christmas Day comes. 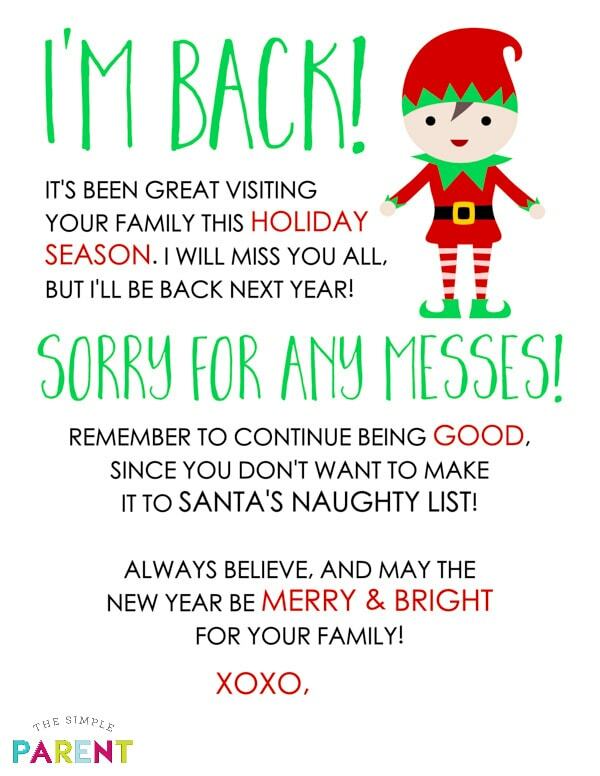 DOWNLOAD OUR FREE PRINTABLE ELF ON THE SHELF LETTER FOR ARRIVAL & GOODBYE! I know that creativity can be running thin with the busy holidays. If you want to include a letter with your elf’s arrival or return, you can download and print the cute letters below to make it easier! Or you can just use one as an Elf on the Shelf arrival letter template to help you create your own! I love the ideas of the letters. Our “Elf” appears on December 1st. He usually just appears. We move him throughout the house. Each day he’s somewhere different. He sometimes leaves a little something for the kids, like candy or a small toy. Christmas Eve, he goes to his home…right before Santa arrives. Our elf, Bob arrives every Thanksgiving. He always has a handwritten letter for the kids filled with all of his adventures over the past year. They will make their arrival on a covered wagon filled with toys and leave shortly after. Our Elf makes an appearance the day after Christmas. His name is Poppy. He has done some pretty funny things. I don’t have an elf but my friend does. We love to hide the elf for her kids to find. I dont have an Elf on the shelf but my daughter does for my grandson. I think they bring him out the first of December. Our elf, Charlie, returns each year on the night that we put our Christmas tree up. I’ve actually never done elf on the shelf. I need to research it to find out more. I have never done the elf but my co-worker has. I love to hear how mischievous he is and the different places he appears. We don’t have an elf but our friend does. She posts all about its antics. The kids are all grown so we no longer have Elf on the Shelf. We scour the internet looking for new ideas for hiding places for our elf and pick the best ones. Our elf is found in odd spots like the cereal box to holding the remote. As for how they appear, it has varied from sitting on the towel rack, to sitting in a bowl. No telling where they will appear next. Our Elf comes out at the beginning of December and is always doing crazy things. Right now, I found him in an animated Christmas decoration helping Santa in his sleigh as if they’re best buddies. Our Elf comes out Dec 1st and starts on our fireplace. Ours comes at the beginning of December and arrives with a letter. Our elf comes out on December 1st, in all his holiday gear, and hidden in the Christmas tree! My niece does Elf on the Shelf with her kids. I’m not sure how he comes and goes, but I’ve seen him around the house. We don’t have the tradition of Elf on a Shelf. I’ve heard it’s great fun for the kids (and parents) :)! We don’t have an elf on the shelf so we have no tradition for it. We don’t really do an elf on a shelf or anything like that. I have never done an Elf on the Shelf as by the time I heard about it, my children were raised and parents of their own. My grandkids are all teenagers so I am a bit late in doing the Elf on the Shelf with them, as well. Sounds like quite a bit of fun to be had. This concept/tradition is very new to me..never heard of it before. Our Elf makes an appearance on our dining room lights and on the mantle each morning leading up to Christmas. Our Elf comes out the day after Thanksgiving and makes his appearance in different places each year. This year he was hanging from the chandelier. My granddaughter just got one this year. My daughter just had him show up one day and explained why he is here. He just shows up at different places in the house every morning. Our Elf, returns each year on the night that we put our Christmas tree up and leaves when we take down our tree. Never had Elf on the Shelf. The elf just shows up. He knows when it is the time… or season. My daughter is to old for the elf on the shelf, but I did think about getting one just for fun! Our Elf appears when the tree goes up, gets hidden everyday in a new place, sometimes outside after we have had snow so everyone gets to enjoy him. He retires on Christmas morning, hidden in the tree! 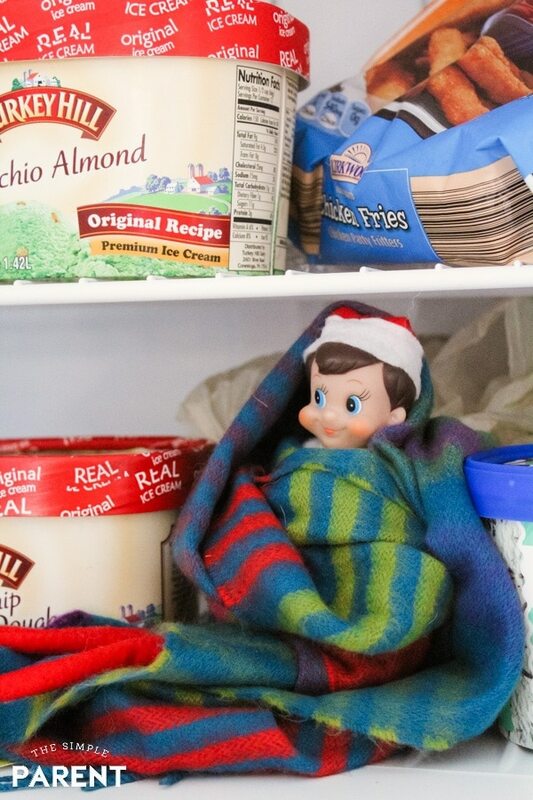 Our elf appears on December 1 usually with a couple of snacks. He just kinda disappears on Christmas Day. We don’t use the elf …. I haven’t had an Elf on the Shelf, but it sounds like a fun tradition to do with my kids. Our elf arrives the day after Thanksgiving with a note attached. She leaves Christmas eve, and a note saying goodbye is left for the kiddies on Christmas morning. I don’t have any little kids. My daughter is a teenager. So he arrives when we get the boxes of decorations down. Usually my daughter sneaks off with him and the next day he is found in his new hiding place. We take turns putting him in his new spot each day. We try to be more creative each time. This year the Elf made his initial appearance, at breakfast, Saturday December 1st. He was hiding inside an empty box of cereal at the table.